One of the many things fans love about the naughtiest superhuman in Marvel is his capacity to reference everyone and everything, from Liam Neeson to Judy Blume. Now, Deadpool is up to his old pop culture juggling tricks again, and with a fourth wall-breaking marketing plan to boot. Walmart shoppers were startled and amused when browsing the US supermarket’s BluRay section, only to find the Human Mutate had photobombed many BluRay slips of iconic movies. You could find Deadpool brandishing scissors as Edward Scissorhands, (a frightening combo), as well as Deadpool channelling his inner Clint Eastwood in The Good, The Bad and The Ugly. You could even see him raging against corporate dreariness in cult classic Office Space, and stepping into Keanu Reeves’ shoes in Speed. Of course, the films inside the covers remain untouched by Deadpool’s ironic wit (as far as we know…) Although, a copy of Fight Club brandishing the masked face of Wade Wilson would still be a worthy addition to any film buff’s collection. ], surely! @Walmart Hello Walmart, how would one get thier hands upon these #Deadpool DVD cover slips (Fight club and so on) if one lives in the UK? These exclusive covers are part of Fox Home Entertainment’s two year anniversary special edition Blu-ray of Deadpool, just as the sequel blasts into cinemas. So Walmart is releasing Deadpool covers for some movies soon, and I gotta say…this is one of the few movie collectibles I would spend ALL OF THE MONEY on if I had it. This was hilarious to see first thing after walking into Walmart. Looooove me some Deadpool. This hilarious stunt occurred after Deadpool/Ryan Reynolds joked about his fate at the hands of Thanos on The Late Show with Stephen Colbert. However, at the end of his appearance, Deadpool grabbed at his stomach, as his body started to evaporate; much like in the heart-wrenching scenes from Avengers:Infinity War. Oh God I don’t feel well…oh what the f*ck! Thanos! You don’t have the budget for this Colbert! 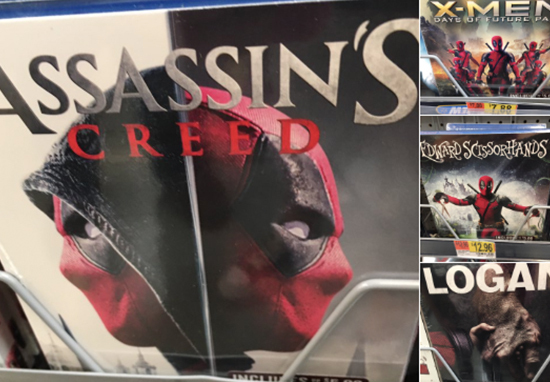 Half tempted to go to Walmart just for the Deadpool bluray boxes….. These high resolution doctored covers are incredibly detailed, and it’s kind of easy to imagine Deadpool keeping Tom Hanks company in Cast Away or as a fast talking misfit in Revenge of the Nerds. Which remake would you most like to see? I saw that Deadpool 2 display with all the movie covers and I’m making a trip to Walmart just to buy that Terminator blu-ray. You can catch Deadpool 2 in cinemas across the UK right now. It’s certainly good to have him back!